Yesterday, Google made a pretty big announcement – they’ve sunsetted Google Places and rolled them into a new product called ‘Google Local’, incorporated directly into their social platform, Google+. However, before all of the information about Local pushes this under the rug, I’d like to talk a little about one particular section of the new Knowledge Graph search results – if you haven’t taken a look at those yet, check out Reid’s excellent post detailing all of the essentials. 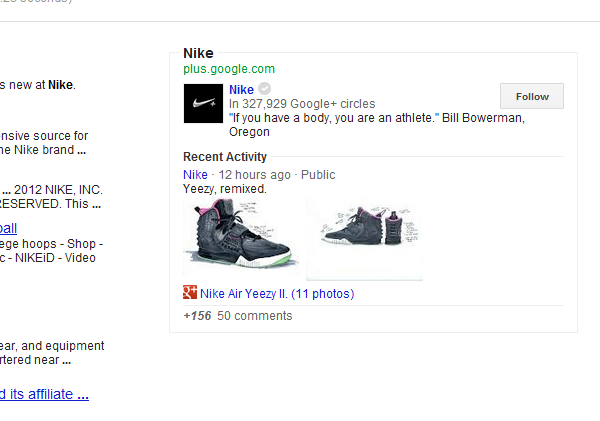 The new section I’m referring to is the “Latest Google+ Post” that appears in the Knowledge Graph search results. 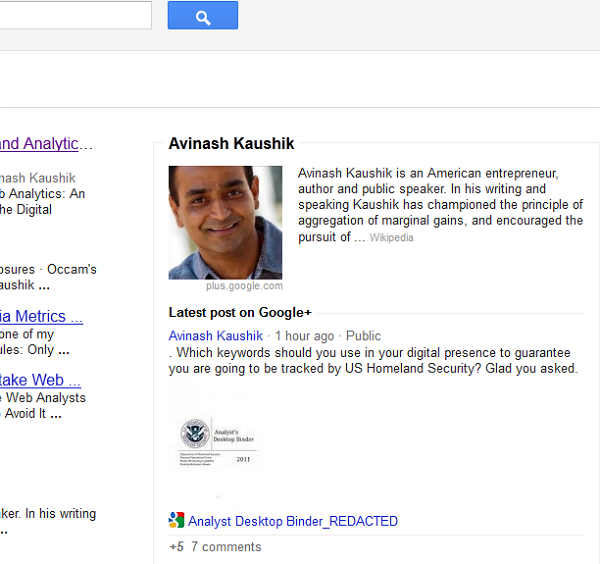 As you probably have noticed by now, if you do a search for someone like Avinash Kaushik (whose Google+ post directly inspired this post), you’ll see his last Google+ update in the Knowledge Graph results. It’s important to note that, unlike the old People & Pages product, these Google+ results only show up for very specific searches. That being said, it’s a pretty nice piece of real estate for Google to be giving an outsider complete control over. Instead of the old People & Pages preview, which was kind of cluttered and jumbled, they have bio information sourced from Wikipedia and they nest the latest post section directly underneath that. Additionally, it will show you image previews and video thumbnails that people share right there on the search page that you can click through to see. Where this gets interesting is because, despite stating that you couldn’t find Knowledge Graph listings for companies, Google has rolled out the Google+ ‘Latest Post’ Knowledge Graph listings for (some) companies. 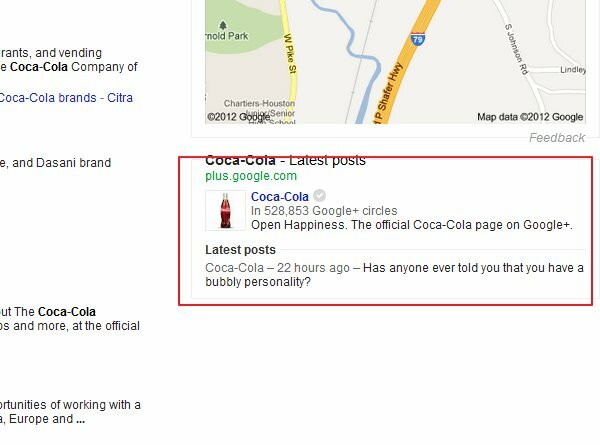 You can even find Google+ information for Coca-Cola by searching ‘coke’. EDIT: Between yesterday and this morning, Coca-Cola stopped showing up with Google+ posts in our searches. Let us know your experience. EDIT 2: Through some careful sleuthing, we’ve determined that it probably no longer appears because Coca-cola hasn’t updated their profile in the past 24 hours. We’re guessing that whether or not a profile’s latest post is displayed is determined by a follower or authority metric combined with a post within a 24-hour window. This could be an extremely interesting space for brands. It’s a huge improvement over the old People and Pages on Google+ section that used to occupy this space. The content isn’t the garbled mess of sourced bio information, and they don’t appear for tangential searches. It’s a dynamic space brands can update with different content, calls to action, and incentives that will always show up above the fold on branded searches. Additionally, they too can reap the benefit of an image and video preview – and the added interest. There’s been a lot said about the importance and power of images in engaging consumers lately, and I think the implications are pretty big. Incidentally, large brands can save money on ads they won’t have to pay for anymore – the Knowledge Graph displaces those sidebar ads for them. What does this mean for your brand? Well, I believe it’s an attempt by Google to get you onto the Google+ platform. I think it’s a fair deal, too – they’re offering a clear and straightforward way to demonstrate a benefit for a brand to have and maintain a Google+ page. My theory is that the deal works like this: you get a free ad with images and videos built in, and they get to benefit from you pulling more users into their service, either intentionally through a social engagement call-to-action or incidentally by virtue of increased traffic. It’s important to note that after a pretty exhaustive list of searches, I only found a handful of brands that were getting the Latest Google+ Post treatment. Additionally, Google has stated that you wouldn’t be able to see companies in Knowledge Graph results, at least for now – we suspect this is because they want to make sure they find a bulletproof way to get them into SERP’s without offering marketers too much control over what’s being said. Additionally, around our office we had some difficulty getting the same results to show up, depending on the browser – this means that your users might have the same issues. What do you think of the changes to the format of the search results? Will it motivate you to get on Google+? Let us know in the comments (and add us to your circles)!